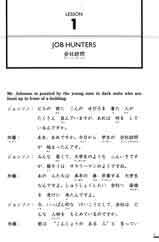 Japanese for Busy People is, as the title suggests, a concise course for "busy" students who want to learn natural, spoken Japanese as effectively as possible in a limited amount of time. This new Kana Version has been adapted and redesigned to reflect current thinking on Japanese-as-a-second-language education. Romanized Japanese, often criticized as being the main obstacle to accurate and fluent pronunciation of the spoken language, has been omitted in favor of native hiragana and katakana scripts. Learning kana from the very beginning will also facilitate a smooth and a fast transition to kanji study. Enough vocabulary and grammar have been provided to enable the learner to communicate in uncomplicated adult Japanese witbout having to memorize excessive amounts of vocabulary and language patterns that are not immediately useful. Exercises and Quiz sections also appear in kana and kanji to reinforce written and oral comprehension as well as production skills. The Kana Version of Japanese for Busy People Ill is the ideal textbook for anyone vho wishes to learn real, natural, conversational Japanese and actually communicate with native Japanese speakers. It also provides a solid foundation and a valuable resource for those who would like to go further with their study of the Japanese language.